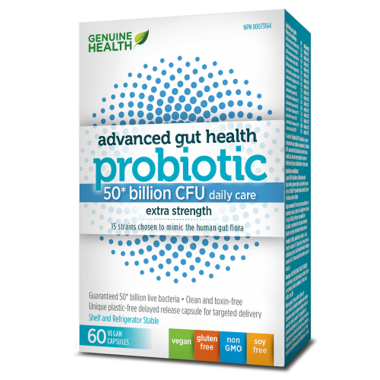 Genuine Health Advanced Gut Health Probiotic combines 15 strains carefully selected for their ability to repair and restore. In a temperature- and humidity-controlled environment, the strains are cleaned to remove toxins and weak cells. A vegan, delayed-release capsule with a fermented probiotic ensures that the strains pass through the stomach acid, reaching the gut where they thrive. Non-Medicinal Ingredients: 100% vegan delayed release capsule (hypromellose, gellan gum, water), potato starch, Vitafiber™ (isomalto-oligosaccharides), silicon dioxide, ascorbic acid. Please be advised that Well.ca follows manufacturer guidelines for storing & shipping probiotics.